In the otherwise excellent Magicians of the Gods, a significant error exists that can use attention. By kind invitation of the author this article aims to expand and detail this claim. Specifically, while the text of Figure 59 makes mathematical sense, the illustration taken as a whole does not. 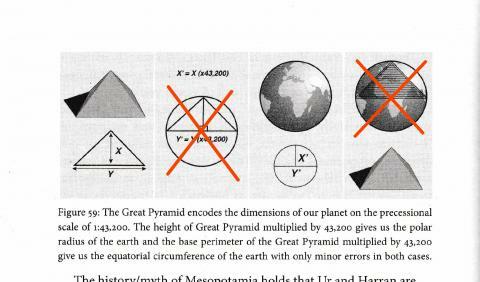 This diagram scanned from Magicians of the Gods does not depict the correct proportions of the Great Pyramid with respect to a globe. Incorrect parts are crossed out in red. First a few facts presented as uncontroversial. The Great Pyramid stands H = 280 cubits (builder cubits) high and B = 440 cubits along each side. 2 pi H = 2 pi 280 = 1760 cubits. Note that the sum of all four sides of the Great Pyramid also equals this value. 4 * B = 4*440 = 1760 cubits. Further note the Great Pyramid has a base/height ratio of pi/2. Multiplying these values by the constant scale factor K = 43200 gives a remarkably good approximation to the physical dimensions of our planet. This observation is of course spelled out in the text that accompanies Figure 59 and thus is also presented as relatively uncontroversial. However in the illustration of Figure 59 one side of a pyramid is shown, inscribed in a circle in which the height equals a radius (X) and the base equals a diameter (Y). This is a trivial identification since Y = 2X always for every circle. And since there are four sides per pyramid, the entire perimeter would be eight times the radius. Such a pyramid would have a base/height ratio of 2, markedly different from our Great Pyramid. Such a pyramid could be made, with its base in proper proportion to the scaled earth model, but not its height. Similarly another pyramid could be made with its height in proper proportion, but not its base. A Figure 59 pyramid with the same base as ours (440cubits) would have a height of 220 cubits, different from the height of ours (280cubits). A Figure 59 pyramid with the same height as ours would be much larger along the base, 560 cubits. No doubt the builders could have created any of these alternatives had they so chosen. 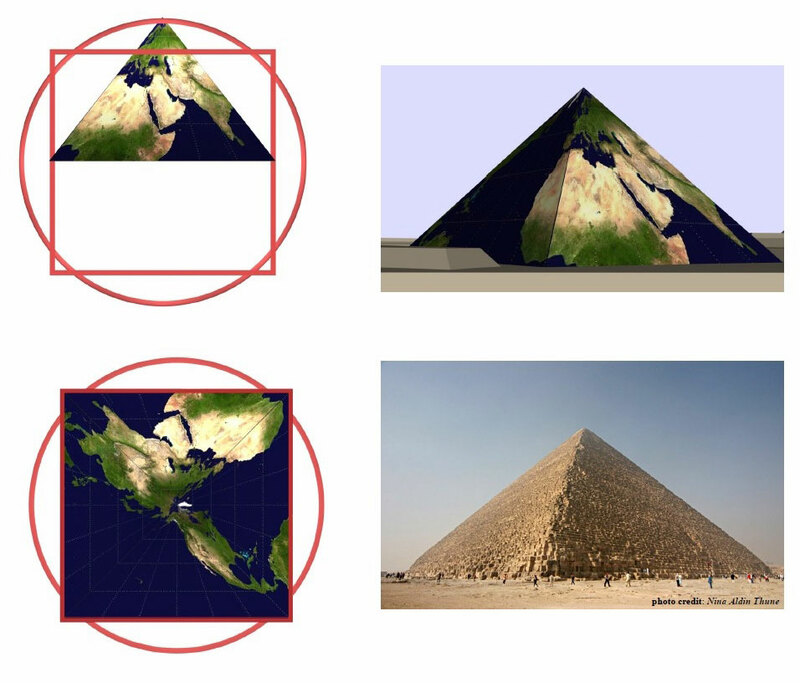 They had to make choices about how best to model a globe, about how to encode specific physical data using the specifications of the Great Pyramid they were to actualize. Modeled to first order as a sphere with uniform radius, only one variable – that radius – needs encoding for later retrieval. A pyramid offers two immediate physical measurements to encode information, base (side) and height. Used to model a scaled sphere, either variable – height or base – could be used. Note that a higher base/height ratio is easier to construct, using less stone. With its higher base/height ratio a Figure 59 pyramid could encode using the base only, and save a sizeable fraction of stonework elevating the structure to a shorter height. Instead the builders took a more difficult path, since the actual Great Pyramid would be harder to build than a Figure 59 pyramid. All things equal, therefore, had it been an option to the builders, they could have and would have chosen it. They did not. By building up, taking the difficult path, they could encode the radius using both the base and the height. This improves transmission efficiency with “magicians” yet to come, as the encoded variable can be duplicated, scaled accordingly, into both pyramid variables. Using whatever method is convenient later, measuring either the height or the base would allow the magician to extract the desired value. Measuring both allows cross-referencing. In addition, understanding the unnecessary difficulty makes the globe modelling even more obvious. This was not a coincidental choice. In conclusion, the builders had good reasons for their decision. Those reasons – knowing the structure as it was meant to be – is the best motive for highlighting the issue with Figure 59, and making a request to correct it. It mattered to the builders so it should matter to us. Doug Keenan was born in Indiana and received his degree in electrical engineering from the Rose-Hulman Institute of Technology. For more than twenty years he enjoyed a career in the consumer electronics field and holds several patents including the multi-brand universal remote control. A computer programmer, botanist and entrepreneur, his work now focuses on pyramids.
. . . ‘That they [The Ancients] got anywhere close to estimated Terran dimensions is quite remarkable. . . That statement assumes a level of hidden modern arrogance, of course, although I find distasteful, thought it needed to be brought up and should be regularly mentioned as modern arrogance seems the greatest stumbling block in any calculation to date. One still ponders the notion how the calculation of an observed “equatorial bulge” is factored into ancient dimensions, if at all. It suggests something of why certain “latitudes” were chosen over the globe – A dynamic spheroid, no less. If the ancients were skilled navigators it would seem that this “bulge” was apparent on large scale factoring or course plotting. Possibly, an irritant. I have no idea what source you are quoting.
. . . Hallo, Doug Keenan. I’ll assume you’re referring to the phrase and terms equatorial bulge, latitudes, and bulge respectively, that I might have grammatically even incorrectly put in quotes. They were not part of your article above just items of interest I still wonder about. Apologies. They were terms I wanted to accent from my frame of reference regarding Graham Hancock’s publication and your expertise. The “equatorial bulge” was something I’ve often wondered about when others theorized embedded measurements of the earth as part of the construction of the Pyramids. I also wonder whether this bulge played a role in long distance calculations of earth’s rotation among the stars and planets as well as earth’s precessional rotation among the ancients. Isaac Newton had assumed and theorized something of this bulge as well as the earth being a malleable sphere of sorts long after the Pyramids were built. Others, like Giovanni and his son Jacques Cassini had their view of this bulge, too. I don’t think that the lunar effect on the planet should be ruled out at this time when considering the measuring techniques of that distant past. Regarding figure 59, initially, at first glance I thought that the upper left and lower right pyramids were optical illusions or the “Bent Pyramid” of Dahshur until I looked closer and read further in the Astronomy and earth measuring section. Makes one wonder why the eyes see what they seem to see at times. There’s still great mystery there to experience despite Graham Hancock’s attention to detail in his books. Measuring things might be scientific, but humankind is still the measurer of things through the use of sensory apparatuses and an imaginative mind both which are subject to change. Hi Richard … thank you for clearing that up. I wonder about those other things also but tried to keep the focus of this article to a specific first-order analysis of figure 59. That’s an interesting observation about the Bent Pyramid in the figure. I appreciate your thoughtful comments. Your observation seemed to correct what seems to be a relatively simple mistake or blind assumption on the authors part. In reading and rereading your response in stating your correction I am trying to understand the possible implications from your explanation of your correction – of encoding in B & H and/or in encoding in the ratio/relationship of B/H. As you had stated either B or H could have been used each singularly you mentioned both were/could be used as a cross reference if in a ratio of 2. Did you state the significance of the fact of the relationship of phi/2 as to what it was encoding and I missed it? If not what was being encoded and was as B & H ate not in ration of 2/1 do they each encode something different or as you referenced below is this an example of a different cross-reference? The error with Figure 59 is indeed a simple mistake easily made. My article should have absolved Graham more clearly because MOTG explicitly assigns credit to someone else. The B/H ratio is just a way to classify pyramidal solids. It can take almost any value, from a low number (an obelisk) to a big number (a mastaba). In the article this value was used to distinguish a hypothetical incorrect pyramid of the illustration (B/H = 2) and the Great Pyramid as we know it. The significance of the particular B/H = PI/2 relationship lies in its unique ability among all possible values to verify the equations you quote. That’s only worth whatever one places in the interpretation that it represents a sphere, an argument presented in MOTG with which I happen to agree. Of all the value the builders could have chosen, many choices considerably easier to construct, that happens to be the value they chose. And yes I am aware of Sacred Geometry, a constantly rewarding subject. Are you familiar with Randall Carlson?